The findings indicate that oil spills at high latitudes could have serious impacts on some of the world's most important fisheries, including those for haddock, cod and pollock. The research published today in Scientific Reports by a team of scientists from Norway and NOAA Fisheries' Northwest Fisheries Science Center in Seattle show that crude oil compounds disrupt the development of key organs in embryonic fish. The study was funded by the Research Council of Norway, the VISTA Foundation and Norway's Institute of Marine Research to assess the risks of oil spills in remote northern Norway, in the heart of Atlantic haddock's range. The international collaboration will provide information to inform environmental risk assessments of proposed oil drilling in northern oceans. Earlier research showed that the polycyclic aromatic hydrocarbons (PAHs) in crude oil interfere with heart development in fish, causing defects that compromise their later survival. The new research indicates crude oil also lead to extreme craniofacial deformities in embryonic haddock. Other research in the related species Atlantic cod suggests this may be a common response of fish in the cod family, which also includes Pacific cod and pollock. The earlier the exposure, the more severe the deformities. Atlantic haddock are especially vulnerable because dispersed crude oil droplets attach to their eggs as they float in the ocean, the study found. 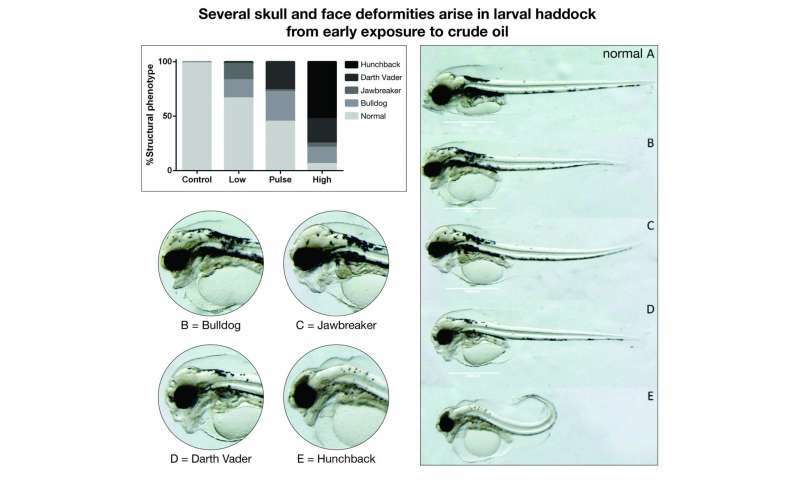 Only 24 hours of exposure to low concentrations of dispersed oil led to certain head and facial deformities in haddock so distinctive and striking that scientists referred to them as "bulldog," "jaw breaker," "Darth Vader" and "hunchback." "The dispersed droplets of crude oil act like a kind of toxic time-release capsule that binds to the eggshells and leads to these extreme abnormalities," said John Incardona, a research toxicologist at NOAA's Northwest Fisheries Science Center. "That creates a unique and newly recognized pathway for crude oil to interfere in the reproduction and survival of these fish." Haddock eggshells likely contain a protein that makes them especially "sticky" to oil and its compounds during a 10 to 12-day period of their early development, Incardona said. Haddock belong to the gadiformes, a large order of fish that also include other ecologically and economically important species such as Arctic cod and pollock, which were not directly examined by the study. It remains to be determined whether these other species are similarly vulnerable. 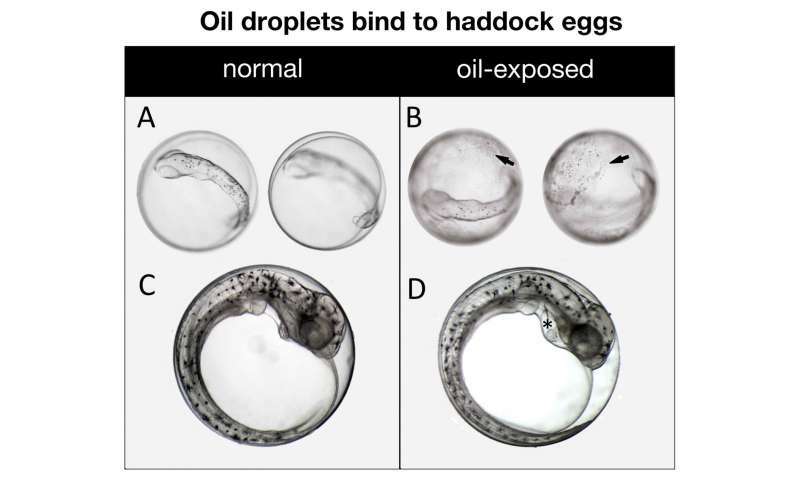 Oil does not bind to the eggs of other fish species as it does haddock eggs but oil byproducts can still cause the deformities. 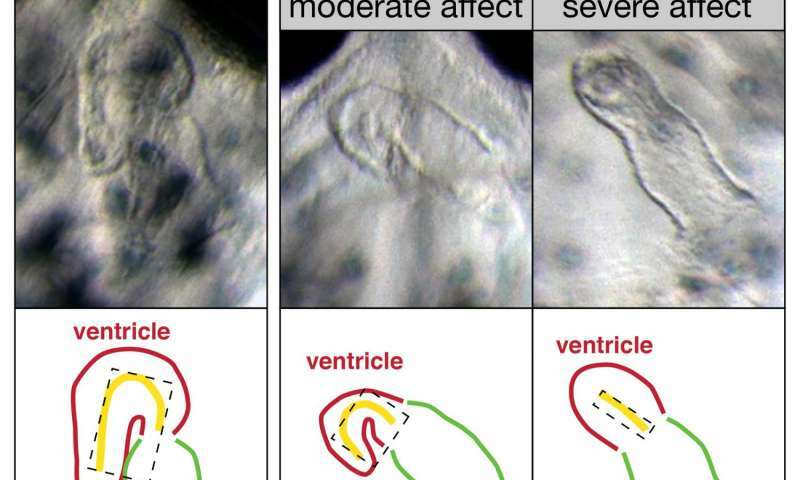 Oil compounds disrupt the physiological channels that signal muscles in the heart and head of the fish, impairing their function and throwing off their early development. "If the muscles are not operating correctly, then everything connected to them including bones do not develop the way they normally would," Incardona said. "You end up with the muscles pulling differently and the bones forming in strange ways that lead to these extraordinary deformities." The deformities compromise the survival of juvenile fish, which must grow and develop rapidly to stay ahead of predators and contribute to the population. An oil spill in an area where haddock eggs are present during the window of time when they are most vulnerable could lead to lasting impacts on the population and other species that feed on haddock and their eggs. Sad how most crude oil in the oceans occurs naturally.